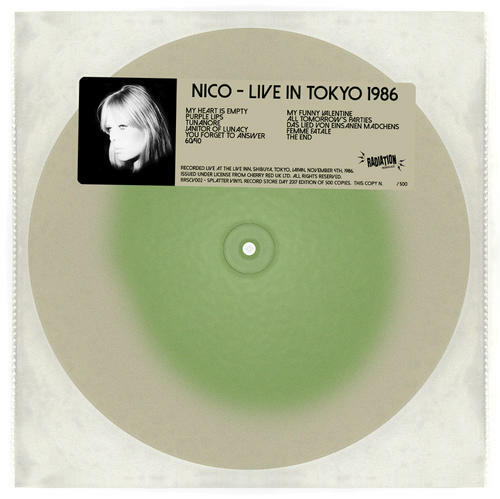 Recorded live in Tokyo in 1986, this limited edition RSD release captures the enigmatic Nico towards the end of her life, which was cut short tragically in Ibiza in 1988. Featuring a backing band that includes synthesizer, conga drums, and more, this dark, smoky concert feels like proto-cold-wave and though 30+ years old could easily fit into the indie zeitgeist of today. With a set list that spans the whole of her career going all the way back to her beginnings in the Warhol Factory, this live set show that Nico, though unfortunately near the twilight of her life, was nowhere near the twilight of her talent. An amazing live set on hand numbered limited edition splatter vinyl LP for Record Store Day 2017.